A small and hardly noticeable building on the corner of First and Main in downtown Sharpsville called The Ritz Theater was one of the most, if not the most important place in town to the children who lived there. Our only theater was small and old, seating around 500 patrons with a red painted concrete floor and worn dirty carpet strips down the aisles. The seats were covered with uncomfortable cracked vinyl and dusty brown curtains hung aside the screen; no-nonsense décor right out of the thirties. In 1947, Mother took my brother Jack and me to our very first movie, The Wizard of Oz, at the Ritz. We’d never seen a television set, let alone a movie and thought the happenings before our eyes totally real. Scared out of my wits, I sobbed and screamed, begging Mom to save poor Dorothy from the wicked witch, and finally hid my face in her lap until Dorothy was rescued and on her way safely home to Kansas. By 1950 we Caldwell siblings walked the nine blocks to the Ritz almost every Saturday afternoon to see the matinee. 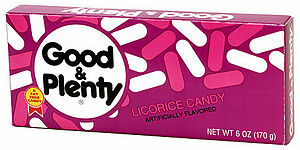 The tickets were a dime and if we had extra money, it went into the tall brown metal candy machine in the tiny lobby. 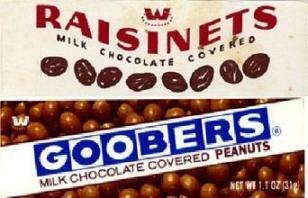 I remember five choices, Good & Plenty, Snowcaps, Jujyfruits, Raisinets and Goober’s Peanuts were standards. Occasionally a choice wasn’t stocked or the box got jammed on its way through the mechanical maze which necessitated going back outside to the ticket man who would refund our nickel but left the malfunctioning machine to upset the next customer. This ticket seller was also the projectionist, locking up his booth just before show time to run inside and start up his large double reeled device. Sometimes, and always it seemed, at an important place in the story, the film would break causing a delay of several minutes while it was patched together. Boos echoed loudly around the theater until our movie resumed. Usually, the main subjects were oaters or cowboy genre and Jack and I would argue over who was better, Roy Rogers, his favorite, or Gene Autry, mine. Near the end there was always a posse chase scene during which the children bounced noisily and rhythmically up and down on the already rickety seats, keeping pace with the horses until the sole usher came down the aisle and shined his flashlight as a warning signal. That flashlight was the law and after two or three infractions, a rowdy audience member could be walked out. We would tear our eyes from the screen to watch the higher drama of a misbehaving boy pulled from his seat and escorted to the door. Tarzan was another huge favorite and through the years we watched his hair and that of Jane’s change from brunette to blonde and back to brunette. “Boy’s”, however, was always blonde. Poorly disguised trapeze bars were replaced by realistic looking vines and the animal fight scenes became less jerky, but to me, the only Tarzan will forever be Johnny Weissmuller with Maureen O’Sullivan as his lovely Jane. Then, as now, the main feature was preceded by a few short subjects including previews of coming attractions, hopefully, a Looney Tunes cartoon with Bugs Bunny or The Roadrunner, but sometimes a very unpopular big band feature with a large orchestra and leader such as Benny Goodman or Gene Krupa. 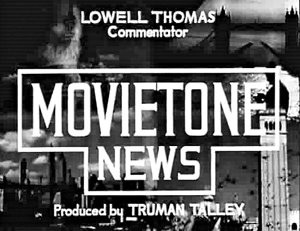 Often an old MovieTone News newsreel narrated by Lowell Thomas educated us on post-WWII events… I don’t remember discussing these wartime events with anyone, but they certainly left a mark on young impressionable minds. Could this be why so many from my generation grew up to resist the Vietnam War and the draft so bitterly? During the dark winter months, Dad would walk downtown to see us safely home. He came early and waited at the next door bar, nursing a single beer and playing penny poker until we came to get him. If the game was “hot” we had to wait. There was never any place for us to sit, so we stood nervously fidgeting around his chair watching a game we didn’t understand while inhaling thick alcohol-laced cigarette fumes. Sometimes one of the other, undoubtedly more affluent, players took pity on our plight and bought us a Coke or bag of chips to ease our wait. Once a Salvation Army “Sally” in full dark blue uniform and bonnet entered the bar and passed around her tambourine. I was utterly amazed to see the men toss in coins (not my dad) and asked Mother about her when we got home. Charity was new to me and I’d never seen money given freely except into church collection plates. Love to hear those details about the Ritz! Do you remember what kind of “Ritz” sign displayed on the front of the building? Was it neon? If so, what color? We had to climb Second Street hill to get to high school every day. On icy days, we’d often slide back down the street whether we wanted to or not!